This section will describe the different types of psychotherapy used for the treatment of the disorder. This will enable you to determine and participate in the most effective psychotherapeutic approach available to you in your community because some forms of borderline-specific psychotherapy are more accessible than others. First, what are fundamental factors about psychotherapy in general that are most important in its success? It has been established over many decades that to be effective in the treatment of any mental disorder, the fundamental principles of therapy be understood and applied by the therapist and the person receiving therapy working together as a team. This is referred to as the therapeutic alliance, (see more below) and is the basic working unit that achieves the great majority of results in psychotherapy. Therefore, which ever form of therapy you receive, this principle is most often utilized. This is especially true for for individuals with borderline disorder for whom disturbed relationships are one of the four central symptom domains. Therefore, if either you or your therapist are not abiding by this principle, there is little reason for you to expect that therapy will succeed. It is more likely that you are simply wasting your time and your money, that your suffering will continue to increase and your hopes be unrealized, often once more. The Correct Diagnosis Is Essential. In the entire field of medicine, effective treatment depends on first making the correct diagnosis. If an incorrect diagnosis is made, any good that results from treatment is purely a matter of chance. Medicine is not a game of chance, it is a scientific discipline devoted to the task of healing the sick. 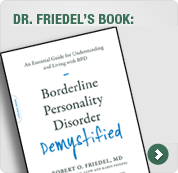 Unfortunately, borderline disorder has been shown to be one of the most frequently misdiagnosed, prevalent psychiatric disorders. The poor results frequently observed in many patients with the disorder who have undergone many years of treatment for other diagnoses are an unfortunate and unnecessary testimonial to this fact. The Therapist Must Have Training and Experience In the Treatment of the Disorder. This principle seems obvious. However, because psychotherapy has only been consistently effective in the treatment of borderline disorder since the evidence-based introduction of medications for its treatment in the mid-1980s, few mental health care professionals have received adequate training and have had substantial experience in treating this disorder. In other words, not all therapists have been trained and are equally skilled in the diagnosis and the treatment of the disorder. A Sound Psychotherapeutic Alliance Must Be Established Between the Patient and the Therapist. Just as all therapists are not equally skilled in the treatment of borderline disorder, not all therapists and patients, regardless of their skills and intentions, are good fits for establishing an effective and professional therapeutic alliance. As noted elsewhere in this website, establishing effective relationships is difficult for most individuals with borderline disorder. This increases the importance of paying close attention to this principle (see above). Specific Rules for Both the Therapist and the Patient for The Conduct of Therapy Must Be Established and Adhered To. These include the time of therapy, the expectations of the therapist and the patient, strict adherence to therapist/patient boundaries in and out of therapy, and other behavioral and structural factors affecting the conduct of and compliance with therapy, are essential. Appropriate Medications Should be Used in Treatment as Soon as Medication-Responsive Symptoms Dictate. This is currently a controversial issue in the treatment of borderline disorder. Until recently, it it has been a long-standing myth stated by many therapists that medications are at best adjunctive in the treatment of the disorder, and by others considered unessential (see Section on Myths). These views have been contested in a recent book whose editors and chapter authors are distinguished leaders in the field of psychotherapy for personality disorders, including borderline personality disorder (see Section on Medications). The appropriate use of medications is now considered by many, leading experts to be essential for patients with BPD who demonstrate medication-responsive symptoms.